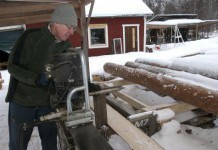 This year it is the tenth anniversary of the Logosol Sawmill model 7. Logosol celebrates this by taking the next step in development, the M8. But what happened on the way here? 1989. 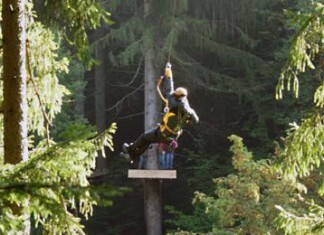 The Logosol Sawmill was introduced for the first time in 1989, on the exhibition Elmia Wood. It struck like a bomb. At that time a mini-sawmill was actually a large piece with a wood bench and ignition bulb motor. Or with a very large electric motor that depended on high-amp fuses. The first Logosol Sawmill was an “unplugged” sawmill. No cord, and with a big petrol powered chainsaw running it. 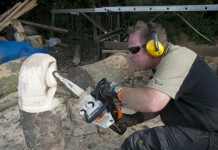 The saw unit was by far the biggest chainsaw on the Swedish market, Stihl 066. 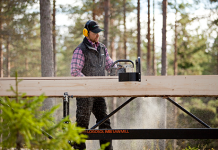 The world’s most sold chainsaw received Swedish type approval because Logosol started to sell the Logosol Sawmill. As all Logosol Sawmills, the first one was also lightweight and very portable. It was designed to make it possible for one person to lift it onto the roof of his or her car, drive it to the woods and cut timber there on the spot. The sawdust was left in the woods, and you could drive back home with sawmill and timber. The sawmill was not bound to any specific place and over the years it has been transported by air as hand luggage, tied to pontoons on seaplanes, and so on. 1990. Model 1 was made of standard aluminium profiles, screwed together like a big Meccano construction. Fascinating for those who like building kits, complicated to others. Due to this the M2 was introduced already in 1990. It was then the guide rail, which is still in use, was designed. By using aluminium profiles made specially for the purpose, the sawmill became simpler to assemble and its length was increased to five metres. During the 1990s new models were introduced every second year and the number of accessories increased. When the M5 came, all development potential was exhausted. 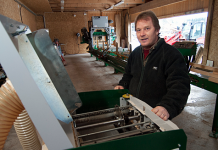 The work with developing a new generation of sawmills begun. The M5 is the ultimate sawmill of the original type, and is still being manufactured. The 066 became the present Stihl MS660. It is still the world’s most sold professional chainsaw. Extremely reliable, and almost impossible to wear out. It does its job during many years, on the sawmill and when felling trees in the forest. In addition, it is a workhorse on the woodyard. 1993. The old village sawmills disappeared one by one, and the need for stationary sawmills grew. Modern circular and band sawmills were unreasonably expensive. 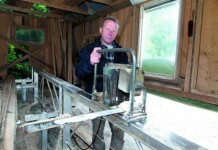 The demand for an improved Logosol Sawmill increased. It already started in 1991 with extensions for the guide rail of the Logosol Sawmill. In 1993 came the first electric saw unit, E5000. 1995. The most common objection to the Logosol Sawmill was about the wide sawing kerf. In practice, the difference was minimal compared to a circular sawblade, especially when considering the fine and smooth sawn surface. If you plane off the defects that the surface gets when being sawn by a circular sawblade, the difference in material loss disappears. 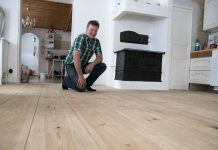 But Logosol chose to listen to the customers’ demands for a narrower kerf. In 1995 the first bandsaw unit, BS320, was introduced. Initially, it was a sensitive machine, but after years of improvement it has become a reliable workhorse. 2001. The Logosol Sawmill model 7 is introduced, 5.5 metre long, wider, sturdier, and with more accurate height setting. On older Logosol Sawmills the height is adjusted with the help of lock pins. On the M7 the log beds are raised to the sound of clicks by using a crank. One click is either 1/8 or 1/4 inch, depending on the setting. With the M7 came more accessories to make it possible for everyone to build a sawmill that is perfect for his or her needs. 2011. Now model 8 is introduced. It is described in the article next to this. The Logosol Sawmill M8 is the combined unplugged and stationary sawmill. Perfect out in the woods and at home on the backyard.